MY DEAR MALEVICH exhibition by Tom R. Chambers at the Novosibirsk State Art Museum [as a part of the aniGma-4, Fourth Novosibirsk International Festival of Digital Imaging], Novosibirsk, Russia, May 10 - June 10, 2007. The above Pixelscapes ... as a homage ... were found within the photo [to the left] of Kasimir Malevich [Ukranian-born artist, 1878-1935] via magnification, filter treatment [halftone] and isolation of the pixel(s) in Photoshop. Malevich founded the art movement, Suprematism in Moscow, 1913 as a parallel to Constructivism. Suprematism ["supremacy of forms"] is a study in abstraction conceived in itself - non-objective and not related to anything except geometric shapes and colors - and a precursor to Minimalism. He states, "Under Suprematism I understand the supremacy of pure feeling in creative art. To the Suprematist the visual phenomena of the objective world are, in themselves, meaningless; the significant thing is feeling, as such, quite apart from the environment in which it is called forth. I took refuge in the square form and exhibited a picture which consisted of nothing more than a black square on a white field. It is filled with the spirit of nonobjective sensation which pervades everything. This is no empty square, but rather the feeling of nonobjectivity." This homage is also a confirmation of Chambers' Pixelscapes as Minimal Art and in keeping with Malevich's Suprematism - the feeling of nonobjectivity ... the creation of a sense of bliss and wonder via abstraction. Chambers' action of looking within the Malevich photo to find the basic component(s) - pixel(s) is the same action as Malevich looking within himself - inside the objective world - for a pure feeling in creative art to find his "Black Square", "Black Cross" and other Suprematist works. And there's a mathematical parallel between Malevich's primitive square ["Black Square"] - divided into four, then divided into nine ["Black Cross"] - and Chambers' Pixelscapes. The pixel is the most basic component of any computer graphic, and it can be represented by 1 bit [a 1 if the pixel is black, or a 0 if the pixel is white]. And filters [tools (e.g., halftone)] in a graphics program like Photoshop produce changes by mathematically modifying pixel values based on the values of neighboring pixels. So as Chambers mentions in his Pixelscapes article, Malevich and those Minimalists who followed later would probably have had great appreciation for this basic and mathematical component ... the pixel. And beginning in 2000, his Pixelscapes were somewhat of a revelation for him when compared to the nonobjective works of Malevich and other Minimalists generated 40 years before the pixel and 80 years before the Digital Revolution. It seemed that Chambers had managed to do what they had done through the simple process of magnification, treatment and isolation of the pixel(s). "Chambers' Pixelscapes have been exhibited in Novosibirsk and also at the Solovetsky Monastery. He is working with the idea of a small unit or cell of an image, which shows a fantastical world through print and animation. This new black-and-white series - MY DEAR MALEVICH - is a part of the Fourth Novosibirsk International Festival of Digital Imaging at the Novosibirsk State Art Museum [May 10 - June 10, 2007]. It is a pleasure for us to show this series that stems from the Suprematist traditions of the great Malevich. Kasimir Malevich was a remarkable artist of the 20th century who looked deeply into the philosophical content of images. Chambers uses this same philosophy in his long-term art projects such as Pixelscapes. And what is especially pleasant is that he brings his understanding and knowledge to art students at Zhaoqing University in China who are just beginning their artistic studies. "Can an exhibition of art be both physical and virtual, a historical yet avant-garde, forward-looking homage with one foot in the current 21st century digital art scene and the other in the rich 20th century history of Modernist art? The answer is, "yes!" If you are Tom Chambers and your base of operations is the Fine Arts Department of Zhaoqing University in the Guangdong Province of China. For several years now, Mr. Chambers has treated his students at Zhaoqing University and their peers at selected universities ranging from Wake Forest University, the University of Louisville, the Art Institute of Boston, the State Art Museum of Novosibirsk, Russia, Rensselaer Polytechnic in Troy, New York (among others), as well as, anyone with access to the web to a cross cultural mix of student digital art and photography. Based on themes from "Self/Soul", "Into the Future" or the color "Red" these projects are brimming with culture and art. Chambers has infused his students with his own sense of wonder, introspection and a desire to examine and communicate. Which brings us to one of Tom Chambers' own most recent and personal exhibitions entitled "My Dear Malevich" on display from April 2 through 15 in the art gallery of Zhaoqing University. This is the physical/virtual part of this exhibit. Wherein we see on the web a presentation of what must be, in real-time and space, a very striking exhibit. Consisting of many, large-size, black and white prints of hard-edged geometric designs "My Dear Malevich" is also an homage to the Russian artist who carried earlier Cubist work entirely into the abstract and non-representational. Kasimir Malevich founded the Suprematist art movement around 1913 and opened the door to true non-objectivity in modern art. This exhibition expands inward (so to speak) from research into the progenitors of Minimalism, an artform in which Mr. Chambers has been experimenting for several years with his series of "Pixelscapes" exhibitions. Utilizing the most basic unit of any computer graphic; the single pixel, his "Pixelscapes" serve as colorful pathways into the purely metaphysical aspects of art which, by virtue of presenting so little, leads the viewer to so much in terms of their own emotional content. With "My Dear Malevich," Chambers describes for the viewer a process by which he travels (via magnification) into a digitized photograph of Malevich and discovers at the singular pixel level arrangements which echo back directly to Malevich's own totally abstract compositions. This process is such an apt metaphor for Malevich's own journey deep with himself, as well as, his discovery of the non-objective soul of art contained within the objective world as to constitute a form of visual poetry. This visual poetry contains the ironic connection between Modernist philosophy which moved visual art from figurative representational pictures of the physical world into an expressive and emotional world of abstraction; and, the digital realm in which the purely abstract unit of one pixel off - one pixel on, has been utilized to reproduce once again, with breath taking accuracy the physical world. Now, Chambers' has shown a path by which this tool, which so often serves hyper-reality, is forced to reveal the abstract soul at its very core. Was Malevich thinking in "pixels" without knowledge of the term and even many decades before the fact of the technology, which utilizes this basic component? His association with Futurism might account for this sort of metaphysical connection. And, so it is that we have the aspect of this exhibition that straddles a whole century of art. From the earliest beginnings of Modern art to the latest developments in the tools by which the newest works are being made. The ground that is covered is immense, but the time between the two virtually disappears in this exhibit. It seems that with "My Dear Malevich" it is not a matter of what is old (or new) being new (or old) again; but that what is "old" and "new" exists simultaneously. That which is "gone" is also, at the very same time, ever-present." "JD Jarvis' review is a most essential discourse of not only this historically portentous exhibition but of you and your oeuvre stratagem, an investiture of nearly ineffable wonder that says virtual past-present-future brought to the e-world and now the reality of tangible documentation in a venue that Malevich would have been proud to share with you." "What can be said about Pixelscapes? They're beautiful - DYNAMIC. Like Josef Albers except this work is lyrical. I really like the evolution of the square. Its a movement that reminds me of my movement. I also like the squares that are surrounding your portrait. Does this mean that the artist is the original square? The artist turns into color? Or is it so that the artist turns into art? An interesting transformation. In any case, it is a wonderful journey." "Synchronicity is alive and well as I view your Malevich exhibition - so reminiscent of the work and intentions of my husband's work, Laurent Boccara." "What you are doing looks very exciting." "It's an elegant idea and well executed." "Congrats! It's a terrific project." "While China itself is going through a kind of postproduction remix phase, I'm interested in the way you are remixing the digitized version of Malevich, as an image, within the traditional context of both gallery and object, while highlighting the pixel as the primary visual element in the making of new work. Congrats on your show! The documentation of it makes it look very exciting and I am intrigued by it." "Kasimir Malevich covers a wide range of styles and color/black-white imaging. Tom Chambers has isolated and deepened that side of Malevich's non-representational and devilishly focused square (and what we now see in the pixel). The presentation is austere with no one - unlike Chambers' other online shows with many others in dynamic interaction, but rather we see reflections of the same images in the ceiling and the floor, creating a space not unlike the George Lucas sci-fi THX-1138 movie. The absence of people in the exhibition rooms mirrors their absence in the imagery. But is this calm? Is it provocative? Are there any emotions? Malevich's striving to strip away content associations may have been poured into his work, but how a viewer sees these images can be quite otherwise. So, too, Chambers' images. Tom Chambers has created a dialogue running back and forth in time about this very seductive side of making images. Of course, should Chambers continue down this path, what will happen to the pixel analogy when he chances upon Malevich's black circle? I'm sure we will all be delighted." "As an old believer in the singular importance of Tom Chambers' creative explorations with regard to driving a leading-edge stream of evolution of the digital-still-image-as-art into this new millennium, I am absolutely delighted to see him go back to print after the fascinating Pixelscapes diversion, with this stunning new exhibition, 'My Dear Malevich'. Not that I know anything much about fine arts, but in this rising new era of burgeoning empowerment of individuals by technology across all streams of human endeavour, all over the world, when the more popular leading-edges of many creative streams are often about little more than fascination and infatuation with the shiny new baubles of new mediums in themselves, it is important to so manifest and be reminded that high art should certainly derive from, and serve, much deeper folds in the brains of any individual, community and generation." "Your art epitomizes the double meaning of the word: a fragment, an incised part of something already in existence - and just because of this incision - is an injury to the finished surface, to the tangle of writing or a finished picture. It is the same and not the same at the same time. Once the signs are scars, then the wounds will tell tales of some non-alleviated history. The post-human art of our era has moved the farthest away from the ideal which reached the calmness of total emptiness by putting instincts to silence - consequently, your Pixelcapes." "Tom Chambers is blessed with an uncanny ability to marry high-concept with visual beauty. He demonstrates his ability to do so in his 'My Dear Malevich' exhibition, where he riffs on the work of the Suprematist artist, Kazimir Malevich, to create wonderfully intriguing Pixelscapes. Chambers' Pixelscapes merge the analog and digital worlds, and merge the past with the present to create a new kind of imagery that brings wall-based visual art into the 21st century. His work is interesting to think about, and pleasant to look at. What more can we ask for from the art on our walls?" "I very much enjoy the critical, analytical and aesthetic nature of the artwork. As you are aware, much of my own work is an exploration of the digitally minimal and the fundamental structures that comprise media technology - so I feel well-placed to understand and comment on your artistic concerns in this area. I feel that many contemporary artists working in New Media utilise the pixel without understanding its core essence in terms of both technology that creates it and the connections it has to the art historical past. I did not have such negative feelings when considering this body of work. I find the premise of the work is a relevant extension of the Suprematism and Minimalism art movements of the 20th century, in which you revisit critical explorations from the past and augment your investigations with present day technologies and context." "At the beginning of the 20th century Kazimir Malevich was at the forefront of a revolution in art. His work took chances and explored new directions in representation. Malevich was an experimenter, pushing art to the edges. Today, at the beginning of the 21st Century, Tom Chambers' work bridges 100 years of art history and creates connections between his own ground-breaking work as a digital artist and the ground-breaking work of Malevich. Chambers' Pixelscapes explore issues of digital representation as well as refer back to the seminal dialog about representation that Malevich and his contemporaries initiated. Look beneath the elegant simplicity of the art of Malevich and Chambers and you will find the essential building blocks of art. Look closely at Chambers' images and you will find the building blocks of today's digital revolution." "The work is very interesting." "An exciting review and a thoughtful tribute to creative work. Congrats." "My first thought upon seeing your powerful show in black and white was an homage to the 'Tomb of the Unknown Soldier' and also the Aleksandr Solzhenitsyn novel, 'One Day in the Life of Ivan Denisovich', where with the least amount of freedom and the smallest bit of material, the hero saves a bit of comb and some trinkets. His soul is still his soul, and he can make something of nothing - no color, no material - and no one can take that from him. Stark? Yes. Art? Yes! Congratulations!" "Black Square , consisting of nothing more than a black square on a white field - one of Kazimir Malevich's earliest works into Suprematism - becomes the starting point, ninety two years later, for an exhibition by Tom Chambers simply titled My Dear Malevich. This is not necessarily new work for Chambers. In 2000 he explored the pixel in what has become his ongoing exploration under the namesake of Pixelscapes [A pixel (picture element) being a single point in a graphic image, an abstract sample.]. In his article The pixel as Minimal art, reference is made to Malevich's Black Square (1915) and Black Cross (1923). What is new about My Dear Malevich, is Chambers removing the pixel from the screen and placing it on a gallery wall as large digital images, a transfer that becomes an all at once opportunity to see the totality of the work. To enter a space and see larger than life pixels displayed one after the other in all their complex diversity allows for a truly meditative experience. What is more interesting is Chambers' starting point for the project, a photograph of Malevich in which he turned the telescope around and concentrated on a small area of the image. By enlarging this one small area, the pixels become a vast universe of the nonobjective out of which emerged the exhibition My Dear Malevich." "Your work is very interesting to say the least. I am a biologist by training, and I compare the pixel to a living cell. Alas, but even the cell and pixel have even smaller components to consider. I do not know much about Minimalism, but I am interested in finding the basic unit of thought, learning, intelligence, and personality. Where the realm of thought intersects with the laws of physics that govern this plane of existence may hold the answers to the nature of human experience including art appreciation and other high levels of thinking. I enjoy your exhibits and hope you continue to produce thought provoking material." "A refreshing extrapolation of the pixel, and it appears to be well accepted [balanced] all around." "The variety and range of what you do, your imagination and originality, are just amazing." "The fascination with this study is the time spent to truly bring to us the pure abstraction of the pixel we digital artists use everyday and even project into a visual installation at a live performance of digital fine arts that must be a visual sensation for all participants. I personally visualize the installation with the classical electronic music by Warren Furman." "Fascinating project - image reduced to its fundamental core, pointing with delicious lyricism to the singularity of the source." "I know your Pixelscapes work quite well, and I find it very interesting. The My Dear Malevich exhibition is absolutely fascinating. What a range of impressions you are creating out of a very few pixels." "Malevich is a traditional resource of art. Chambers uses it like a Chinese Artist uses the traditional form of brush painting. The abstract works of Malevich were studied by Chinese artists 10 to 15 years ago. Why did this study cease? I think because this kind of art doesn't have Chinese roots. We can become enlightened again through Chambers' exhibition. Most contemporary Chinese artists do not address this form with ease like their predecessors." "Tom R. Chambers is a blend of the West and the East - frank and charming with a disposition of an Eastern writer - and this combination seems consistent when viewing his early photographic works, which are full of humanity, morality and caring. His recent creative work, 'My Dear Malevich' has a very different connotation: bright and fashionable, which conjures up skin texture within a multi-colored grid or graph. The meaning is manifested within a Western world's characteristics of materialism, public display and desire with curious, affective tonal range and realm of imagination - it's beckoning. Chambers seems to want to elucidate a subject - make a significant attempt at clarifying a notion. His appreciation of Kazimir Malevich's Suprematist artwork is only a way or an excuse to present an artistic trend through iconography that borders on 'religion'. The Pixelscapes that comprise the project represent a collective expression. The subtle grays, blacks and whites combined with the cross symbol remind us of a certain 'awe'. The artworks transmit a solemnity and moving atmosphere. The expression is direct and effective, which is the most obvious characteristic of contemporary art." "Tom R. Chambers has been an iconoclastic digital artist and passionate teacher of digital art for many years. He is most recently visiting lecturer on digital and new media art and digital photography in the Fine Arts Department of Zhaoqing University in Zhaoqing, China. His own art is a celebration of digital abstraction and reductionism in a long series of works that he calls "Pixelscapes." His most recent series is called "My Dear Malevich" and is a tribute to the celebrated Ukranian-born artist Kasimir Malevich (1878-1935] who was founder of Suprematism, a non-representational art that featured geometric forms and shapes. These new images are a confirmation of Chambers' dedication to minimalist art and to the pixel, in all its potential and limitations." "I really like 'MY DEAR MALEVICH'. I think the concept behind 'Pixelscapes' is fascinating. It is also interesting that Malevich is important for new media/net artists." "Heartiest congratulations - wonderful concept and brilliant execution." Click on process to view Chambers' approach to the pixel(s) in the Malevich photo. Click on aniGma-4 to view brochure cover. 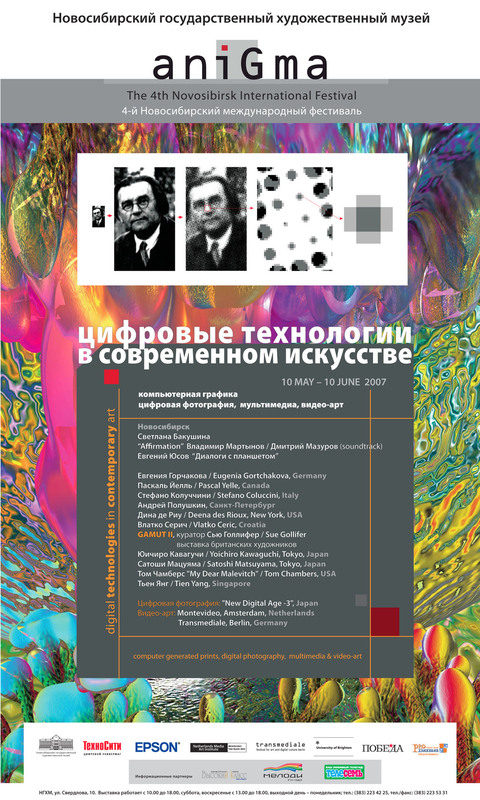 Download the aniGma-4 [Fourth Novosibirsk International Festival of Digital Imaging (May 10 - June 10, 2007)] poster. My Dear Malevich, Suprematism Infinity: Reflections, Interpretations, Explorations (Group Show), Atrium Gallery, Harriman Institute, Columbia Institute, New York City, New York, U.S.A., December 1, 2015 - January 22, 2016. Note: this exhibition is in conjunction with the "100 Years of Suprematism" conference, Shapiro Center, Columbia University, New York City, December 11 - 12, 2015. It is organized in celebration of the centenary of Kazimir Malevich�s invention of Suprematism and the first public display of his Suprematist paintings in December, 1915. The two-day conference is organized in association with the Harriman Institute, the Lazar Khidekel Society, and SHERA. It features presentations by an international and renowned group of scholars. Among them are leading researchers in the field from the United States, Russia, and the United Kingdom. The event includes a presentation of "Kazimir Malevich: Letters and Documents, Memoirs and Criticism" (London: Tate, 2015). My Dear Malevich, Beyond the Borders [The Guest section] (Group Show), Novosibirsk Municipal Center of Fine Arts, Novosibirsk, Russia, November 3 - 21, 2010.